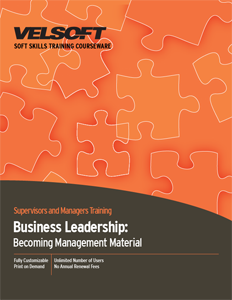 Business Leadership Training Material is designed to develop leaders in the workplace. Confidently train your employees and supervisors leadership skills to become management material. Teach your workforce how to achieve personal mastery, how to achieve a shared vision, system thinking, managers vs. leaders and more! Seeing is Believing This sample manual to teach Business Leadership is in MS Word format. This workshop is a tool for participants leadership development. It is designed to help participants create and accomplish their personal best, and to help them lead others to get extraordinary things done. At its core, leadership means setting goals, lighting a path, and persuading others to follow. But the responsibility entails much more. By accepting the challenge to lead, participants come to realize that the only limits are those they place on their self.